"In order for us to develop appropriate and successful strategies to help dogs and their owners/carers it may be more beneficial for us to look at behaviour in a different way. Not many dogs remain in one state all of the time." Labels are given to dog behaviour because it offers a clear marker for dog behaviour in a shelter situation or between other professionals who may be working with the same dog but as many behaviours over lap it may limit the possibilities that are on offer to those who specialise in working with dogs with behavioural problems or work professionally with dogs and the early triggers for the more obvious behaviour may be missed. Two labels that are commonly used by many trainers and owners are whether a dog shows submissive or dominant behaviour. These labels can be very misleading and certainly when it comes to ‘dominant’ behaviour, can trigger inappropriate handling and unsuccessful behaviour modification techniques that not only break down the canine/human bond but fail to address the underlying reasons that caused the more obvious behaviour to manifest in the first place. Once a label is placed on a dog the focus is usually on that more obvious behaviour. Positive and appropriate behaviours may be overlooked and go unrewarded which seriously limits the possibility for change. In order for us to develop appropriate and successful strategies to help dogs and their owners/carers it may be more beneficial for us to look at behaviour in a different way. Not many dogs remain in one state all of the time. How about we replace the words dominant and submissive with introvert and extrovert? Remember we are looking at behaviour at this point. This exercise is not simply to determine whether a dog has a tendency to be an introvert or an extrovert in its nature. 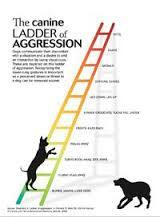 ​The term ‘ladder’ is also often used particularly in relation to aggression and whilst this can be extremely helpful in encouraging people to watch for early signs of stress it may in some instances place further limits on how some people perceive both the dog and its behaviour and would tend to imply that there is a specific order in how a dog expresses his/her concerns which is often untrue. It is also my experience that some breeds of dogs do not give clear signals that they are feeling threatened and this can take some people by surprise. Understanding that behaviour is a continuum and not something that is fixed can open our eyes to see dogs in a new way and to understand how we may use the many tools at our disposal to help bring each dog into a better state of emotional and mental balance. If we think of extreme introvert behaviour being at one end of a spectrum with extreme extrovert behaviour being at the other end of that spectrum we can see that most dogs (and people) are generally continuously moving through that spectrum to some degree depending on many factors. These include the situation that they are in at that time i.e. in a car, at the vets, in a kennel etc, the effects of human behaviour around that dog, external or internal stimulus in the home/garden/shelter/park/class, diet, training techniques and so on. To help give you further clarity I am going to apply colour to that spectrum. At one point on the scale let’s say that the colour is dark blue (excessively introvert). At another point of the scale the colour is orange (excessively extrovert). I am deliberately avoiding the colour red as it has so many negative connotations in society and in dog behaviour. It may be even more helpful to consider this spectrum to be a circle rather than a straight line since it would more accurately illustrate the point that there is rarely a beginning or an end when it comes to behaviour and to serve as a reminder that the dog can move from one extreme state to another in either direction or even directly across the diameter without necessarily moving through the entire colour range first. As we move from the colour dark blue in one direction, (clockwise) that colour moves through varying shades of blue, then green, yellow, and orange. The colours are merging all the time, they are not in blocks and there are no obvious definitions between each shade. If we move through the spectrum in the other direction (anti-clockwise) the colours move from dark blue, to pale blue, pink and then orange. A dog that is generally considered to be well balanced in its temperament will be near or in the middle of that spectrum but will move through that spectrum depending on a variety of factors. The balance point will be a horizontal line across the centre of the circle. These factors will also dictate to a degree how far or how quickly each dog moves around that colour spectrum and whether it is able to return to a more balanced state or not. Another way to look at this spectrum might be to say that the hours at night when the moon is at its highest point is at one end with the brightest hours of daylight when the sun is at its peak being at the other end. Looking at behaviour in this way can be a good reminder of the constant ebb and flow of behaviour. It is not static. And even the effects on our lives caused by these two peaks in the earth’s cycle will be and can be influenced by other factors including weather, an eclipse, the seasons, and of course the inventions of man. Just as the hues of the dawn are dissimilar to those seen at dusk, the colour spectrum that we are looking at in terms of dog behaviour will vary on both sides of those peaks. These are some examples of the difference between the two phases and both are complimentary to each other. A dog that I would generally consider to be in balance would be able to move effortlessly through these phases without the need for much intervention from its owner or carer. For example, there will be times when a dog is exuberant and joyful such as when playing a game or when the owner puts on their dog walking boots, but also times when that dog may be hesitant such as going into the vets perhaps, or because it is trying to work out what behaviour needs to be repeated in order to get the click and treat or even when it is being approached by a dog or a person that it may not know. The dog may be active during the day (extrovert), but will also sleep well at night (introvert). Most dogs, like people, will of course have a tendency to be naturally more introvert or extrovert in both character and therefore behaviour but problems tend to arise when the dog is stuck in one phase and has moved or is moving further away from the point of balance around the spectrum. If this occurs or has occurred in the past we may see more obvious signs of imbalance. These lists are by no means comprehensive and not necessarily exclusive to either behaviour or phase. They are intended merely to give you a guide to enable you to start thinking what body work, ground work, equipment, and training techniques may be useful to help bring the dog into better balance. 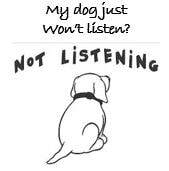 It can also help you to see how our own behaviour around dogs can inadvertently trigger more extrovert or introvert responses including our own body language, movement, interaction with the dog including training games and techniques and use of the voice. It is important to remember that all behaviour overlaps and merges and that any experience the dog may have can drive them in one direction or the other regardless of their start point within the spectrum. For example a dog that may have been naturally shy and introvert when young may have been forced to become more vocal and outwardly reactive in order to make his fear or confusion known. Similarly a dog that was naturally outgoing may have been subjected to forceful handling and aversive training techniques in a bid to curb his naturally exuberant behaviour and that dog may have shut down and become withdrawn as a result. Looking at behaviour in this way also helps owners and carers to understand that the dog is not necessarily making deliberate choices about how he or she responds to the environment that humans have created for him/her. It helps to remove emotions from the equation and to see and hopefully understand the behaviour for what it is and not what some may perceive it to be. Again this is by no means a comprehensive list but I would encourage you all to start making notes of how the dogs that you work with and/or own respond to a variety of situations. Ideally you should see a mix of both introvert and extrovert behaviours depending on circumstance and even the time of the day. Start trying to develop or think of strategies that can help you have a positive influence on the behaviour that you see at the time. Think back to the analogy of the spectrum being like the cycle of the day and night. You might need tools that warm, energize and brighten or you might need tools that cool, calm and diffuse the intensity of the light. My Dog Just Won't Listen! We are pretty sure this has happened to most of us and more than once! Find out why this happens and what to do about it. Is there "One Thing" that leads to a well behaved dog? Is it possible that there could be “one thing” which is the secret to having a well behaved and likeable dog? If so, what is this “one thing”? Is it the breed of the dog, the breeding of the dog, training, home environment, genetics, the owner’s attitude or just a random “gift from the gods” that causes a dog to be a really nice chap? Has grief for a dog who died every overwhelmed you?